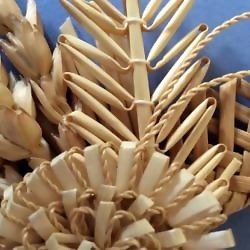 I have worked with straw for more years than I care to admit and in that time have produced work for and contributed to TV, radio and film either as a specialist contributor, as a maker or by providing props. My specialism is as a straw plaiter working the traditional methods as used in the 19th century hat industry. My publications include, Swiss Straw Work, Techniques of a Fashion Industry which is a comprehensive instruction book covering techniques used in the Swiss hat materials manufacturing industry. I am also co-author of an instructional book for making Corn Dollies. I am very proud to be a Queen Elizabeth Scholarship holder.